We didn't kill this story, because having it 404 would be a bad user experience; and we didn't automatically redirect you to a different story because that would be confusing. Thanks for your understanding. Google’s Chromecast dongle is the best way to send video from a phone, tablet, or PC to your television, but its lack of a proper remote and TV interface can be a sticking point. Until the end of August, you can try YouMap for free by downloading the APK file and sideloading it onto a Fire TV. This is sort of a complicated process, but AFTVnews has some helpful instructions on how to sideload Fire TV apps from a computer. If you have an Android phone or tablet, you can follow this simpler sideloading process instead. After dealing with the sideloading process, setting up the app is easy enough. Head to the Fire TV’s Settings menu, then go to System > Applications > Manage Installed Applications. 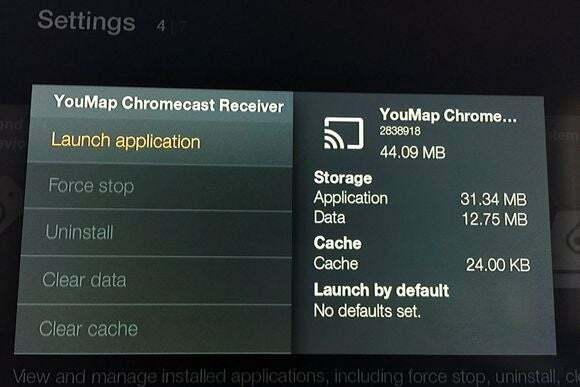 Scroll down to YouMap Chromecast Receiver, and launch the app. I did have to restart the Fire TV (through Settings > System) to get YouMap working properly. Launching YouMap for the first time from Fire TV Settings. YouMap works in exactly the same way as Chromecast. Just open up a Cast-enabled app on an iOS or Android device, and a Cast button should appear on the screen. 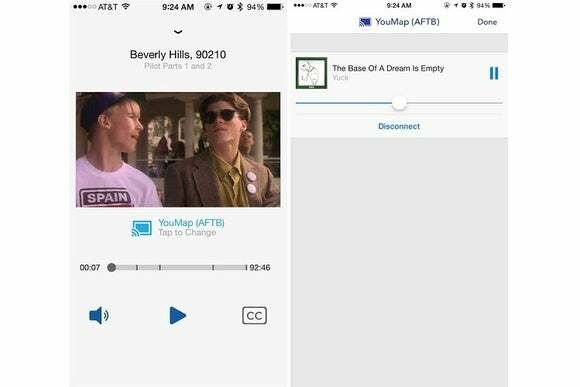 Select “YouMap” from the Cast menu, then select a video or song from your phone or tablet. It should start playing through the Fire TV. Casting also works through Google’s desktop Chrome browser if you have the Google Cast extension installed. This lets you mirror any browser tab, which is great for playing music through your home entertainment setup, and for viewing photos on the big screen from sites like Facebook. Tab mirroring also works with video sites, such as Hulu.com, though performance can be choppy and audio is prone to latency. Some websites, including YouTube, support native Casting, which eliminates these problems. YouMap supports mirroring Chrome browser tabs on video sites like Hulu.com. There’s just one catch: YouMap doesn’t work with video apps that use digital rights management (DRM). With HBO Go, Google Play Movies & TV, and Hulu, I received error messages saying they couldn’t load licensed or protected content. YouTube, Twitch, Pluto.TV, and Watch Food Network wouldn’t even show YouMap in the Cast menu, and Crunchyroll failed to connect with the Fire TV. While YouMap doesn’t work with Netflix, that’s a non-issue for Fire TV users; Netflix already supports casting to Amazon’s media streamer out of the box. Just look for “Fire TV” in the Cast menu from Netflix’s iOS and Android apps. YouMap taps into the existing Google Cast buttons in apps such as CBS (left) and Pandora (right). A couple other quirks worth mentioning: YouMap doesn’t support controlling volume with your phone or tablet’s hardware buttons, as some apps do with Chromecast. Apps that have on-screen volume controls seem to work fine. Also, if the Fire TV is in sleep mode, you may have to initiate casting twice, as the first attempt merely wakes the device without actually making the connection. I’ve written before that Chromecast is a love-it-or-hate it device. 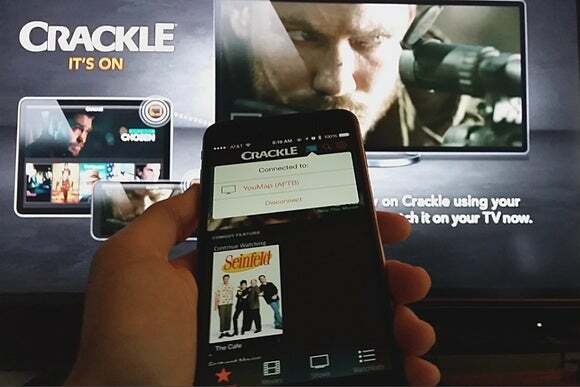 For couch potatoes who always keep a phone or tablet handy, using a touch screen to browse and send content to the television can feel borderline magical. Adding those capabilities to the Fire TV could be well-worth the $8 asking price. My only concern with YouMap is that Google will at some point shut it down. Even though Google doesn’t have control of the Amazon Appstore, it can still stop unauthorized cast receivers from working, and it has done so in the past. You could very well spend $8 now and be left with a useless app a few months down the road. What are your other options? If you haven’t already bought a Fire TV, you could pick up an Android TV device such as Google’s Nexus Player, Razer’s Forge TV, or Nvidia’s Shield Android TV. 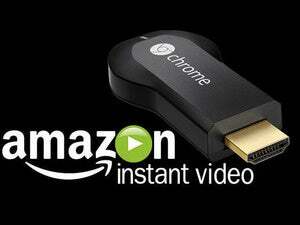 All of them include full Chromecast functionality, along with a proper remote and TV apps. Just be aware that none of these devices offer an Amazon app, making them non-starters for Amazon Prime subscribers. The other option is to wait things out. Amazon recently launched Fling as an answer to Google Cast, and while its app support is sorely lacking right now, that could soon change soon; it’s supposed to be quite easy for app makers to support Fling if they already work with Chromecast.